Rock-Salt-Lamps.com is a company specializing in providing legitimate Himalayan Salt Lamps. These special lamps are produced from salt crystals mined from the foothills of the Himalayan mountains in Pakistan. You can be assured that you are receiving an actual Himalayan Salt Lamp. Our salt lamps produce a balance of airborne negative ions, which are scientifically proven to enhance your well-being, your health, and your environment. Airborne particulates and bacteria need moisture to survive. 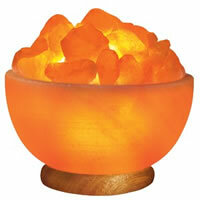 These Himalayan salt lamps "capture" that moisture and dissolve the bacteria and particulates. By purchasing one of our salt lamps, you can feel better about the air you breath being cleaner and free of bacteria, which keeps you and your family healthy!